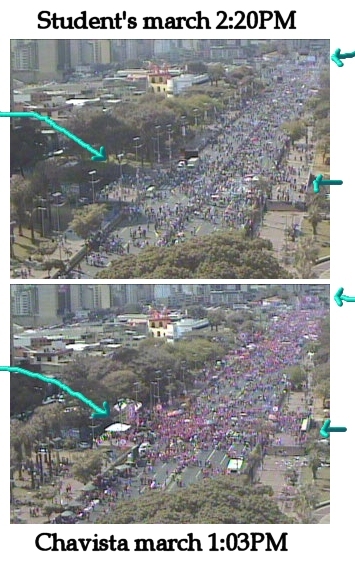 Thus chavismo is trying to do its counter march, and faithful for the extreme objectivity of this blog, I am using the Movistar traffic Cam to monitor its progress exactly as I did yesterday for the students rally. But let's start by an important note for those who are late into this game, including foreign correspondents. Chavismo has its own timetable to fill up the Bolivar Avenue. They start earlier than anyone because they give the day free in many public administration if they put on the red shirt and go wherever they are told to go. "Or else!" being sometimes added. I have enough relatives and friends in the public administration to confirm that. And thus Chavez will only arrive when the Bolivar Avenue is full enough for their taste. It can be at 11 AM or at 6 PM, meanwhile his followers are left to loiter around for hours, which is exactly what I am goign to point out in the picture below. 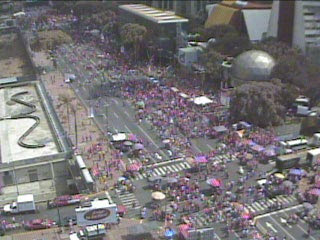 Above it is the same angle as yesterday at 2PM when the first student marchers started arriving. Below it is the picture of the chavismo reply one hour earlier. Obviously you already see more people, but do not stop yourself at this detail, we will have to wait for Chavez arrival. Instead look at the amateur green arrows that I have placed. Top right corner arrow. The white rectangle of the students has become a red rectangle. Yesterday the students wanted to display an image of Bolivar but the Nazional guard forbade them to do so. Apparently Bolivar now belongs only to chavismo. Left side arrow. Of course, when you are going to have people waiting for hours for the beloved Supremo Ego Chavez, you need to entertain them least they get tired enough to go home. Thus you set up entertainment and other activities. Observe the set up that has suddenly appeared! And in addition you get a group of red shirts in front, away from the grand stand so that when you film from the grand stand the camera will be fooled into believing that the Bolivar is "requete ful". Right side arrow. Same as above but a smaller one. Who pays for that? The students did not have any of these distractions and yet they filled up the Bolivar. Who pays to attract people who might not be there to watch Chavez but to attend some impromptu concert? For good measure I include the view of the East side of the Bolivar at the same time. You will be able to observe by yourself the same phenomenon. Compare to yesterday's blog post to convince yourself. It is even pathetic for chavismo: the Bolivar yesterday was evenly occupied and today there is a big bulk of chavista on one side and nothing on the other. NOTE: I have made my point and I have little interest in covering this march further. I have already done more to cover it with this post than what VTV did yesterday to cover the opposition march. I did check again at 1:44 and it was almost the same as the ones that I have already put up right. This might suggest that not that much more chavista will be coming, unlike yesterday when people started streaming around 2 PM continuously for a couple of hours. I will check later if time allows and post if worth it. Back home from work I am trying to catch up some. Globovision has side by side, on a split scree the Marcabaibo Rally and the Caracas one. The Maracaibo rally looks almost as big as the Caracas one (population half of Caracas, to give you a sense of perspective). And the Maracaibo rally is infinitely nicer to watch. It is colorful, there have many speakers, they speak of the future, flags wave all the time everywhere. The Caracas one has the same tired all repeat of Chavez (Busssss, the CIA, whoever votes NO is a traitor, Uribe gets his orders every morning, the Empire is the enemy that we need to defeat Sunday, etc...), it all a threatening red, no spontaneity in the crowds except for the cues, and the second half of the Bolivar is melting down fast. Globovision is letting them side by side why VTV yesterday all but denied there was an opposition rally in Caracas. 'nuf said!